In collaboration with Africa Gomez I have worked on a number of projects with the Brachionus plicatilis species complex. These rotifer species are inabitants of saline ponds worldwide and we were able to show that “B.plicatilis” is in fact a collection of cryptic species highly diversified at the DNA sequence level. It has since become clear that these species also differ in ecology, morphology and mating compatibility. Within the single good species B.plicatilis ss we have worked on phylogeographic questions both within Iberia and on a global scale. The image is by Scott Mills of an Australian Brachionus sp., likely B. plicatilis. The bryozoan Celleporella hyalina is found globally throughout the cold and temperate shoreline. In collaboration with Roger Hughes, Gary Carvalho and Africa Gomez we sampled globally, sequenced mtDNA and nuclear loci, carried out detailed morphological measurements and assayed mating compatibility. Together we produced very strong evidence that C. hyalina is a cryptic species complex comprising approximately 15 separate, reproductively isolated species that had been diverging for millions of years. This is a protocol to isolate microsatellites from a library. It is not a microsatellite enrichment protocol, there are many of those, and almost all of them work well in combination with PIMA. Once a microsatellite-enriched library has been created PIMA replaces traditional approaches (radioactive hybridization, sequencing all colonies) to detect which are the microsatellite-containing colonies and isolate the insert for sequencing and primer design. Cost is at worst very similar to that of radioactive hybridization and proves much cheaper in our hands. Speed and efficiency are at least equal to hybridization techniques. We tend not to use the RAPD enrichment protocol anymore. It is just about the fastest but other methods typically enrich more effectively. I like the protocol of Hammond et al  that employs binding to biotinylated microsatellite oligos. Any method of enrichment can replace stage A (left). In mitochondrial DNA recombination is often hard to detect and discriminate from variability generated by other mechanisms. In order to test whether animal mtDNA could recombine I investigated the by-products of mtDNA recombination in the nematodeMeloidogyne javanica. Our experiment conclusively showed that intramolecular recombination was teh cause of deletion in M. javanica mtDNA. Since both intramolecular and intermolecular recombination are likely to utilize the same enzymes via similar mechanisms, and mtDNA recombination is already well documented in plants, fungi and protists, it is very likely indeed that all organisms possess the ability to recombine mtDNA. Subsequent work by other groups has strongly supported these assertions, and the interesting questions now revolve around the molecular mechanisms, frequency and evolutionary consequences of mtDNA recombination. This work was done in collaboration with Brad Hyman at UC Riverside. 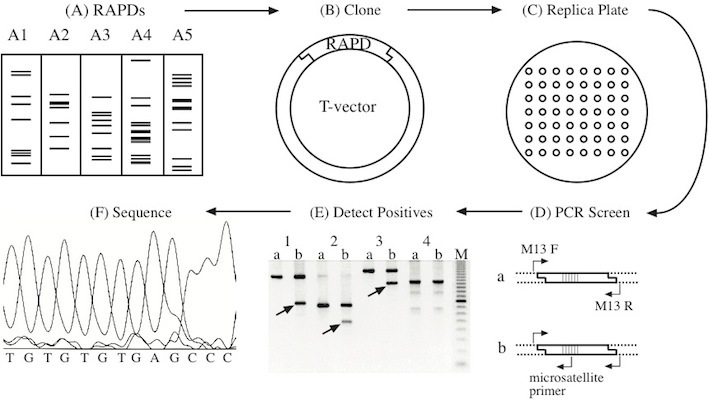 The figure shows the mtDNA repeat arrays used to detect recombination.